Dr. Angélica Salomão, WHO AFRO. Photo by MSH Staff. “If we don’t have drugs, we don’t have programs,” Dr. Angélica Salomão of the World Health Organization Africa Region said, summing up the motivation behind the 2nd Africa TB Regional Conference on Management of TB Medicines. From December 5-7, 2012 representatives from the World Health Organization (WHO), National Tuberculosis Programs (NTP), global TB partners and donors came together in Zanzibar, Tanzania to discuss solutions to the most pressing TB medicines management challenges. SIAPS hosted the interactive meeting where over the course of three days, representatives from 13 African countries formed working groups to identify priority challenges in their countries and develop concrete action plans to overcome obstacles. The importance of this conference is underscored by the heavy burden that TB bears on both individuals and communities. TB caused 1.4 million deaths in 2011, despite the fact that it is both preventable and curable. The challenges of ensuring that individuals with TB are diagnosed and receive appropriate treatment often begin with a lack of accurate data. Ensuring that the right quantities of medicine are available for patients when they’re needed is a complex task, one that requires good historical data in order to predict future need. When the availability of medicines doesn’t match the need, TB programs can experience stock-out of medicines or wastage due to expiry of drugs. The first situation has enormous implications for patient and community health, while the second leads to unnecessary costs for programs that are already under-financed. With these challenges in mind, the conference opened with sessions highlighting recent success stories from countries demonstrating innovative solutions to common obstacles. In Nigeria, for instance, the NTP implemented a Logistic Management Information System (LMIS) tool called PICKnPACK that allows managers at the central level to monitor performance of every segment of the supply chain, from the national to the local level. Prior to the implementation of PICKnPACK, Nigeria experienced widespread stock outs of TB medicines for approximately four months out of each year. Following the implementation, the country has not seen any widespread stock outs for main anti-TB drugs since January 2011. Kaspars Lunte, GDF MDR-TB Team Leader. Photo by MSH Staff. 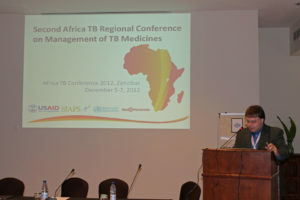 The conference also featured presentations from key TB medicines partners such as Kaspars Lunte, the Global Drug Facility’s (GDF) MDR-TB drug supply Team Leader, who presented on Current Challenges in Drug Management. GDF, an initiative started by the Stop TB Partnership aiming to expand access to quality-assured first- and second-line TB medicines, is collaborating with SIAPS on an early warning system for stock-outs that is currently in the pilot phase in several African countries. Because many countries work closely with the GDF, the conference offered a valuable opportunity for discussions about current bottlenecks in the procurement system and possible solutions going forward. 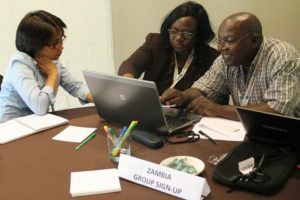 Participants broke into country teams to identify the pressing challenges facing their country’s management of TB medicines, assess the root causes of each barrier, and develop proposals for action. Each team spent an afternoon ranking priorities and collaborating with SIAPS technical staff to design feasible interventions, including the financial and technical resources that would be required. Zambia group. Photo by MSH Staff. On the final day of the conference 13 representatives outlined TB pharmaceutical management workplans for their countries. Each presenter showcased their team’s planning from the previous day and fielded questions and comments from donors, representatives from the WHO, and NTP staff in attendance from the region. In addition to creating an opportunity for key players in TB medicines management to tackle pressing challenges together, the conference also highlighted the wealth of resources that lies in the collective knowledge of the countries present. Whatever challenge is identified in a country, there is likely an experience from elsewhere in the region that can offer insight or theoretical knowledge about how to approach the problem. Despite the range of themes highlighted throughout the conference, it was clear that all aspects of TB pharmaceutical management rely upon the availability of valid, reliable data. As new medicines and diagnostics enter the TB landscape in the coming years, it will be increasingly more important for countries to translate sound data into programmatic decisions that ensure resources are used to get quality TB medicines to all those who need them. Going forward, the conference moves towards this goal where participants will collaborate with other key stakeholders in their country to finalize their plans. As part of its strategy towards supporting sustainable, country-driven activities, SIAPS will provide a certain amount of support and guidance through its regional pool of TB experts where needed. 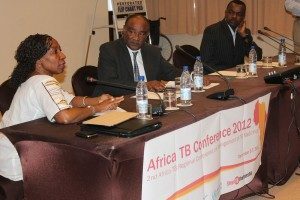 For more information of the conference and to view conference presentations, please visit the Africa TB 2012 Meeting website.